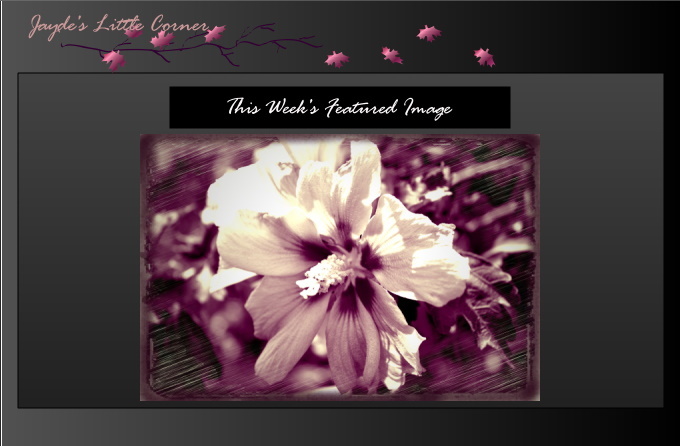 For a limited time I am offering 10% off your purchase at my Gallery when you spend $25.00. There are also additional discounts when you purchase more. 15% off when you spend $50.00 and 20% off when you spend $75.00. Nothing like a last minute contest entry right? I was introduced to Giveaway Blogs by my friend over at Crazed Mind when she sent out a mass e-mail to vote on her contest entry. Now I am entering one of my own in hopes of winning a 16X20 rolled canvas from UPrinting and $100. I like the idea of them both. So the theme of this contest is Passion. What am I passionate about? 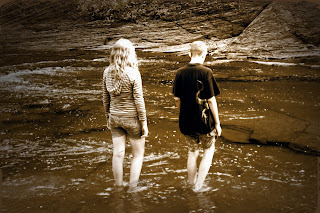 God, Photography, and my children. Since I don't have a picture of God to use, I went with this one of my children. How can I not be passionate about these gorgeous children?!?! Not to mention we were at a beautiful little creek when I took this shot, so perhaps there is a little bit of God in this image too. This post is an entry to the GiveawayBlogs.com photo contest. After being here one whole week, and I've actually been searching for a job since before I left, I finally have a job! I even start working...well training....tomorrow. I am so looking forward to this job as it is in a portrait studio. This is actually the second portrait studio job I applied for. It turns out that I will possibly be working in a town much closer to where I am moving. Which explains why I haven't gotten any of the other jobs I applied for. It is also a manager position that I am looking at. Good pay, potential bonuses bi-weekly and quartery, benefits, discounts....it's a really great opportunity. Thank you to everyone who prayed and sent good thoughts my way. I appreciate you all! As for the rest of things, I am enjoying the cooler weather for sure. The kids have been having a great time with their aunt and uncle who they have a hard time seeing as aunt and uncle due to the closeness of their ages. They have been swimming more times than I can count and are having a great time just messing around and having a good time. We of course miss all of our friends from Texas. One in particular has been on my mind a lot lately. I hear a song today that reminded me of them...twice actually. The song got picked up on shuffle when I was listening to music on my computer then it played on the radio as I was trevelling to my interview. I miss the joking, the laughing, the general conversations...all the good times we spent together. I knew leaving all of my friends would be difficult, but I also knew we would be able to stay in touch through internet and phone. This friend however is different...we were close. Being away from my friend is like a tree not feeling the wind anymore. Today is a good day though, so no more whining. I have a job, I am in New York where it's green and pretty and there are lots of trees, and I have my family. I can't really complain as I have a good life right now. Here's to hoping everyone has a wonderfulo rest of the day and week! This picture was taken Wednesday evening as we crossed the state line into New York. It still took us a good bit of time to get to our destination, but knowing we were in our destination state helped us to get moving and stay awake. We were all very grateful to arrive when we got here. I have spent the last two days resting and getting a good look at this town I am staying in for the time being. The plan is for me to find a job and then move to the town I lived at when I went to High School. I have a couple of applications in at places and I'm hoping for something to work out soon. I still have not recieved my 401K money that was supposed to be my moving money (thanks Dad for coming through on that one) nor my final paycheck and payday was yesterday. Money is tight right now, but things will work out, I have faith. In the meantime, enjoy a few pictures that I've taken since I've been here, see why my kids and I chose to make this drastic move. These are just a few of the pics I have taken so far. I will have to try to upload more later as I am unable to use my photo editing program on this computer to make the image sizes smaller. I am not able to edit any pics at this moment which is mildly depressing. Thanks to PJ's Prayer Line for being my one and only applicant for a sponsor listing! I will give this a try again in the future when I possibly have a larger following and interest in my blog. I am an aspiring photographer and digital artist. Please feel free to take a look around and see what you like. The real 'man' of the house...no really, ask him! Awesome Inc. theme. Theme images by. Powered by Blogger.